Our Condo will be your home away from home. We are ideally located on Florida's sunny Gulf Coast. Some of America's award winning beaches, like Honeymoon Beach, Clearwater Beach, and Caladesi Island, are just minutes away. Tampa international airport is just 30 minutes away, with the major theme parks in Orlando just 90 minutes away. Busch Gardens is even closer, just a 25 minute drive. We are just a 10 minute drive to Tarpon Springs, the sponge capital of the world, and to the historic Dunedin. There is an Olympic size pool, tennis courts, basketball court, shuffle board, a playground with a picnic area, all free to use. There is also a recreation center with a pool table, game room, ping pong table, exercise room, banquet room, and a large screen TV. Just about everything in our condo is new. New carpeting in bedrooms, both bathrooms have been completely renovated with high end materials, new hardwood bamboo floors, new furniture, with a well equipped kitchen. Sports Fans: If you are a sports fan our condo is in a perfect location. Spring training for the Philadelphia Phillies is in Clearwater, just a 10 minute drive. The New York Yankees spring training is at the George M. Steinbrenner Field in Tampa, just 30 minutes away. Baltimore Orioles are at the Ed Smith Stadium in Sarasota, about an hour away, and the Pittsburgh Pirates are in Bradenton Florida, just a 40 minute drive. The Tampa Rays play at Tropicana Field, just a 30 minute drive. If you are a football fan the Tampa Buckaneers play at the Raymond James Stadium, located in Tampa. The hockey team Tampa Lightening play at St. Pete's Time Forum also located in Tampa. Shopping: Do you love flea markets? We are about a 15 minute drive from the Oldsmar Flea Market. There are also flea markets located in Bradenton and St. Petersburg. The new IKEA store is located in Tampa, just a 30 minute drive. There is a fantastic outlet mall, close to Bradenton, just 40 minutes away. Country Side Mall is just 10 minutes away, and Tampa has several shopping malls. The famous YBOR area offers, shopping, dining, and bars. Tarpon Springs, Dunedin, and Safety Harbor offer a unique shopping experience. There are discount stores and grocery stores on every corner. There is never ending opportunities for shopping in this area. Condo Amenties: After a day of shopping, going to the beach, or attending a sporting event come home and relax at the Olympic size pool, or play a game of pool or ping pong in the Rec. center. Or maybe you want to B-B-Q, with areas right in the pool, or by the large playground with picnic tables. Or maybe you just want to relax at the condo, with all the comfortable furniture, and cook a nice meal in the fully equipped kitchen. There is also a washer and dryer in the condo where you can wash all your sandy beach clothes. There is also a lanai located off of one of the bedrooms where you can enjoy your morning cup of coffee, while watching the local wildlife. There is also a foosball table right on the lanai for a quick game anytime. I can guarantee once you arrive you will not want to leave! Both bathrooms are newly renovated with high end materials. 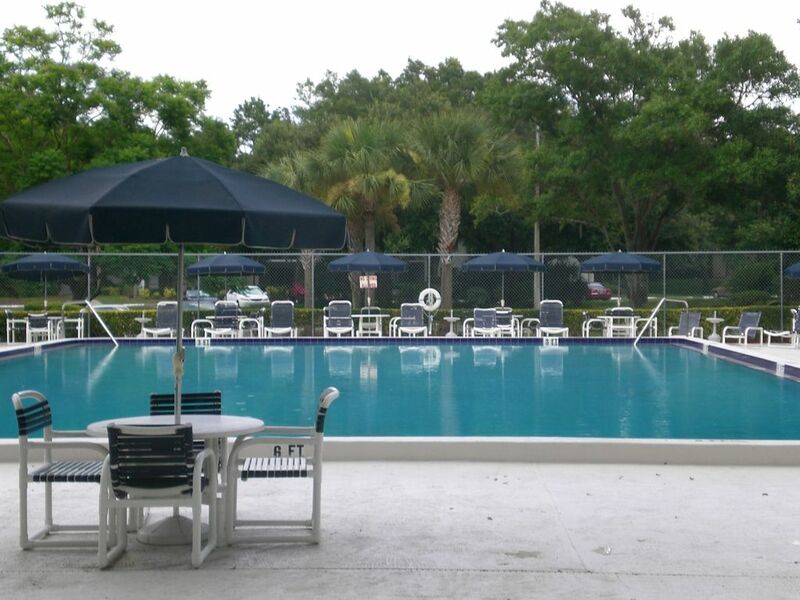 Enjoyed our stay, nice unit great location close to beaches, restaurants many activities and an excellent pool. Pool, location are wonderful. This is such a convenient to everything place. It was a great place to stay and relax. Nice cozy home away from your home. We enjoyed our stay at Fox Chase. The condo was very nice and clean. Cindy let us know that she was available if we needed assistance with anything. We were disappointed that the pool was unavailable the first half of our trip and when it was fixed, it was too cold to use. The deck area was very nice though so we could sit out there and enjoy the sun. If you don't mind being on the second floor, I would recommend this condo. The place was in a perfect location for visiting my dad. It was clean, the kitchen had everything one would need and The owner Cynthia was very responsive. We stayed shortly after the hurricane so the pool was closed while our grandkids were with us but that was no fault of the owner. There was not a hair dryer and the floor near the bathroom needed to be fastened down more but Cynthia said they would take care of it shortly. These few things did not hamper our stay. We hope to stay again on another week long trip. Seasonal rental please contact owner for available dates and prices.